Home » WordPress Plugins » Yoast SEO: Video » Why doesn’t Yoast SEO create a sitemap? Why doesn’t Yoast SEO create a sitemap? Our sitemaps are created dynamically. If you’ve recently made changes to your site, you may need to refresh the permalink structure so Yoast SEO can create the sitemap. The ‘Settings’ menu will expand providing you additional options. Click on ‘Permalinks’. 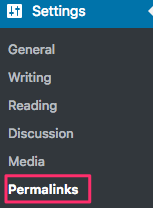 Click ‘Save Changes’ (without altering anything).